We haven’t mentioned Asus in our CES 2018 coverage so far but as usual the Taiwanese PC systems and components giant has a bountiful selection of new goodies to share in Las Vegas. Of particular interest to PC gamers are offerings from the firm’s gaming sub-brand Republic of Gamers (ROG), and below is a wrap up of what was announced yesterday. 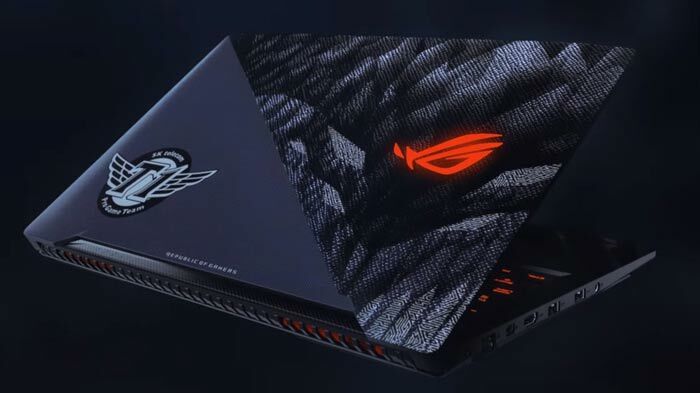 Two new gaming laptops were featured by Asus ROG; the ROG Strix SKT T1 Hero Edition and the ROG G703. The former laptop is a limited edition affair and result of a collaboration between Asus ROG and top eSports team SK telecom T1. You will find this laptop packaged with SK telecom T1 collectables such as a jersey, mousepad and posters. The latop itself aso features signature team designs. As you might expect from one of the top League of Legends teams, the ROG Strix SKT T1 Hero Edition is optimised for multiplayer online battle arena (MOBA) gaming. In terms of hardware it is based upon an Intel Core i7 processor and Nvidia GeForce GTX 1060 graphics, and features a 120Hz IPS-level display with a 100 per cent sRGB colour gamut. The laptop’s keyboard has RGB backlighting and features specially marked QWER keys, N-key rollover technology, plus upgraded switches with 20-million-keystroke durability. The Asus ROG G703 laptop with 17.3-inch 144Hz display on show at CES is the same as the one we featured here in the news on HEXUS, just a few weeks ago. 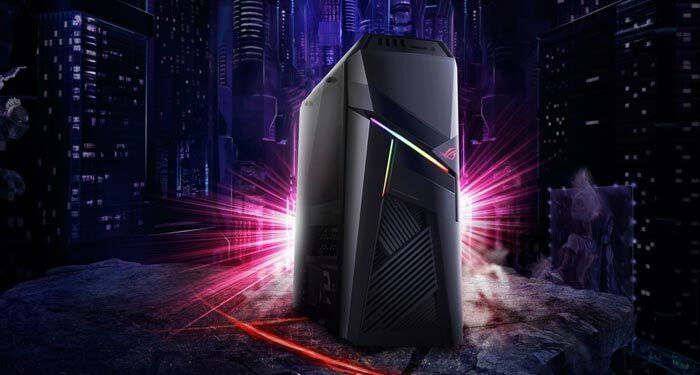 Asus also introduced the ROG Strix GL12 gaming desktop at the CES 2018. This powerful machine is based upon a factory-overclocked 8th Gen Intel Core i7 processor (up to 4.8GHz hexa-core) and Nvidia GeForce GTX 1080 graphics card. Asus seems proud of the desktop’s ‘unconventional’ design with angular slashes across the front, transparent side panel and RGB LED lighting (Aura Sync capable). A more practical element of the design is the expansion bay and eSports-ready easy-swap SSD tray. 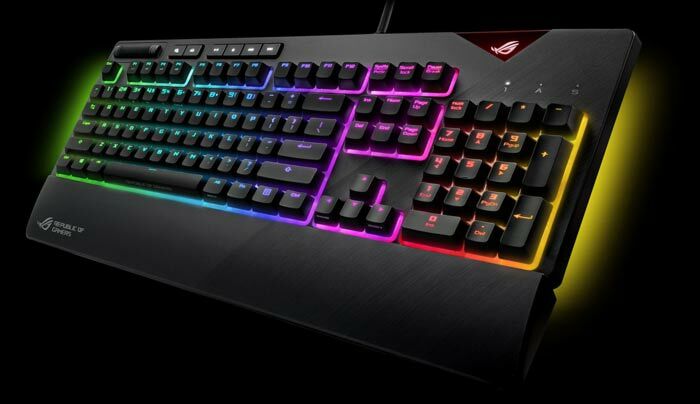 The ROG Strix Flare is a new RGB (individually programmable) mechanical gaming keyboard. It is claimed to offer a great balance of style and ergonomics and uses the respected Cherry MX key switches. Dedicated media keys are present as is an intuitive volume wheel and detachable wrist rest. In addition to the RGB per key lighting this keyboard features an underglow – all RGB features are addressable via Aura Sync. Asus ROG has a couple of dedicated RGB lighting accessories. The ROG Aura Terminal is a quad-channel addressable RGB controller that can enable synchronised lighting throughout your system. 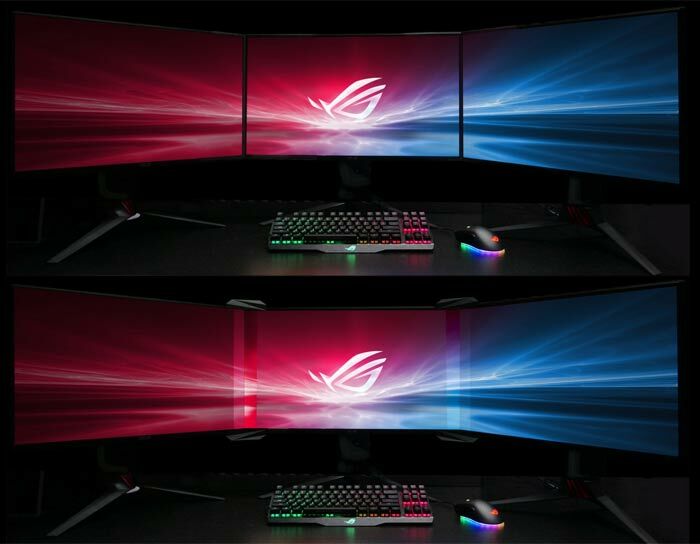 The added ROG Halo technology can provide around the screen lighting of complementary colours to the on-screen action – said to boost gaming immersion. Another lighting accessory, the ROG Spotlight projects a colour synced ROG logo onto a wall or surface. The ROG Spotlight is matte-black finished and can be magnetically attached to surfaces. At CES 2018 Asus ROG is demonstrating an interesting Bezel-Free Kit. These monitor borders are designed to join up multiple displays and use PMMA optical micro-structures that refract light to hide the bezels underneath. There is a with/without kit comparison image below but it would be really good to see the system in action. Hopefully the editor can follow up with a video of the kit showing games being played, from the ROG showcase suite at the CES. We had the opportunity of having a suite tour with Asus' Geoff Gaisor. In the tour we covered the all-new XG Station Pro - an external graphics box capable of holding high-end cards. Handily, the PSU is external, helping minimise dimensions. The $329 asking fee isn't too bad considering that the consumer version costs significantly more. That keyboard….. Just put my Christmas tree back in the loft and now they want to put a substitute on my desk. Lol. And what does an easy swap SSD tray have to do with e-sports anyway. And the sliding front door was done on at least the Cosmos II long before this. And that keyboard is another with that stupid plastic shroud around the keys. Get rid of that rubbish, and make cleaning easier to do without having to remove the keycaps first. Coordinate a theme and compliment it with lighting, don't smother it.